When you are getting married, one of the most important things you will want to do is ensure that you look as perfect as possible. This is obtained by choosing the right dress, the right hairstyle and the right make-up. 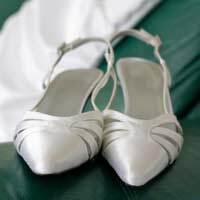 However the key to getting it right is in the often overlooked elements of a wedding outfit - the smaller details, such as jewellery and accessories, and of course, choosing the right shoes. These elements are just as just as important to a bride as the 'bigger' items because they pull the whole look together and can make or break the perfect wedding outfit. So when you are planning your wedding outfit, don't rush the choice of which shoes to wear. If you do, you'll be looking at the wedding photographs thinking 'those shoes really didn't match my dress' - and worse still, so will everyone else! This will depend on the theme and tone of wedding you are having. If you are having an evening wedding, or an elegant, glamorous do, then you might want to wear strappy bejewelled sandals. If you are having more of a hippy-esque, more casual wedding, then you might want to wear embellished mules or flip flops - there are some very pretty versions available that would be perfect for an outdoor ceremony. If you are having everything planned and matching down to the last detail, then you might want your shoes made in the same material as the dress. If so, take a swatch of your dress material to the shoe-makers, and choose a style that shows the material off to best advantage. Once you know the type of shoes you want, you should think about the style and the finer details. Think about the shoes in context with your dress. You probably don’t want to over-embellish and end up looking like a Christmas tree, so if you are wearing a very detailed dress, then simple shoes will look better, and will complement the dress. If your dress is simple, then strappy sandals will look fantastic, and add a bit of sparkle. If you go for more detailed shoes, try and match something in the dress or accessories to something in the shoes – e.g. if your dress has crystal features, then wear shoes that also have crystal accents somewhere – but go for complementing rather than over-powering. If you’re not sure, go for less, not more. If you’re wearing a pant suit, or something that is less obviously a wedding outfit, then there will be lots of scope for you, and you can dress the outfit up or down however you like. If you want the colour of your dress to match your shoes, be very careful to make sure that the colours really do match and don't trust your eye in a store or when looking in a catalogue. There are many different shades and tones of white, ivory, cream and other colours, and considering that even the ever-so slightly wrong shade will look awful on the day - make sure you match them against a swatch of fabric from your dress, and then against the dress itself. You really need to try on your shoes with the dress at some point (not the last minute!) to check that they are the correct height and that you won't be tripping over your dress or breaking your neck trying to get down the aisle. Your final dress alterations should be done, if possible, while you are wearing the shoes you intend to wear on the day. This allows the dress hem to be fixed in place perfectly and make sure that when the ceremony beings you can actually walk towards your intended, rather than stumble. Lots of brides wear really pretty, strappy, sandals or bespoke shoes for the wedding ceremony and the photographs, but have one of their bridesmaids carry a pair of flat shoes (ballet shoes are best) or flip flops which they can change into during the sit down meal and speeches, before slipping back into the strappy sandals for a night of dancing and celebrations. This gives the bride a chance to rest her feet a little and make sure that they are good to go for the first dance. If you do this, just make sure you remember where you put your sandals before you have too much champagne!